I am in several food groups. Recently one of them, The Cooler, had a discussion on Haluski. 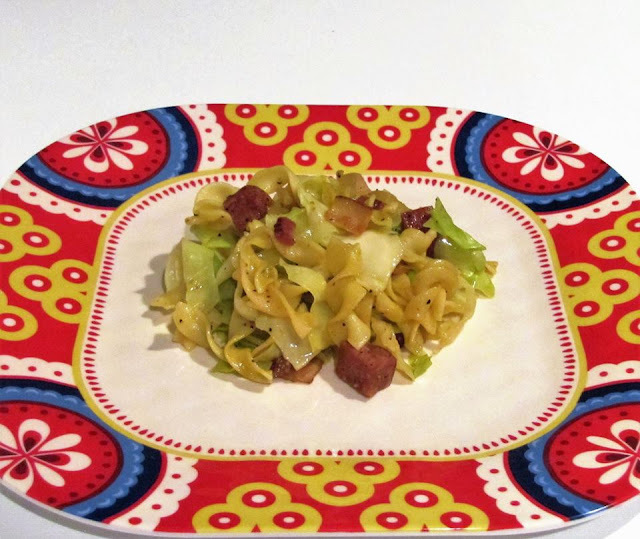 Since I love cabbage and buttered noodles, I knew I had to make it. This is one of those dishes with many variations and with roots in Central and Eastern Europe. After reading all the comments in The Cooler and researching the Internet, I decided to adapt a version from A Family Feast Blog. Since one of my friends in the Cooler mentioned that smoked sausage was often used, I decided to add smoked sausage to mine. My son and his wife had just hosted a barbecue dinner over the weekend and they sent mom and dad home with lots of sausages! I pulled out my onion and cabbage and started chopping away. Then another thought hit me, this would be a great dish to use my Jada Low Sodium Chicken Salt in! I am so glad I did, because it was so good. My husband isn’t a huge fan of cabbage, but he actually liked this and said he would be happy if I made it again. Score! 1. Cook noodles according to package directions, include 2 teaspoons of Low Sodium Chicken Salt in water. 2. Drain noodles and set aside. 3. In a large Dutch oven, brown bacon bits. 4. Add yellow onion and saute until translucent and slightly brown. 6. Stir in diced sausage, butter and 2 teaspoons of the Low Sodium Chicken Salt. 7. Fold in noodles. Simmer on low for 3-4 minutes, occasionally stirring.